Last week pleasantly surprised us a new document made public prepared by the Ministry of Industry on the planning of the electricity sector for the period 2015-2020, in which, either by proximity of an election, or by the goals set in Europe objectives for 2020, Spain opened the door again to install new renewable power. It is worth remembering that since the moratorium introduced by law in 2012, no new installations of this type had been entitled to a special regime that allowed compete in the Spanish electricity market as a producer of electricity. The few facilities occurred in these two years have been limited to self-consumption or off-grid installations. Installations thanks to the famous solar kits. This new planning for including new renewable amounts a notable 8.6 GW, equivalent to an increase of 18% compared to today. Total installed power generation will increase slightly in total count, especially decreasing the power of the combined cycle of gas turbine, underutilized for some years to less than 10% capacity. Additionally, although not seem to have reason to be, the reopening of the Garona nuclear plant is expected in 2016. The plan calls for the "need for new renewable capacity, with increased capacity especially important for the most competitive and technically efficient technologies, including wind and solar." The existence of both wind turbines and cheap solar panels enabled economic efficiency of these technologies. At almost 23 GW of wind power were installed in Spain would add 6.4 GW over the next five years, and 4.4 GW of solar PV would be increased up to just over 6 GW in 2020, equivalent to an increase of 29% of the currently installed capacity. The strategic plan does not cover FIT systems through premiums, so that the planned facilities should consider other mechanisms to return on investment. In the case of solar photovoltaic facilities two types are generalized; the self-consumption, which is perfectly profitable without the need for extra fees, although it needs a simplified legislation to help its expansion, and large plants for sale to pool price in the spot market, as the big 3 plants projected in Extremadura, which would add 1GW of photovoltaic power only by itself in the Spanish electricity mix. 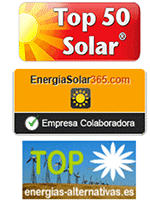 From tienda-solar we highly value this door that opens to the installation of new capacity in the country that became number one in both wind and photovoltaic. While we hope that the intention which has led to record these goals is more than an electoral opportunism which deflates when passing the appropriate period. Although clearly it demonstrates that renewable energies can compete as equals in an electric spot market prices with other electricity production technologies, even in a market where the impact they have on society is not valued. The next few years may witness a lowering of energy prices for the first time in history, due to the boom of renewable energies. This fact probably glimpsed the famous financial analysts who have allowed a spectacular fall in oil prices in recent weeks. The black gold is becoming less valuable as consuming countries have begun a path of no return for independence from it, and the new gold is the sun and wind, more democratic and accessible to everyone.